Cpl W J A Sanders, who has been reported killed in December 1916 with the 2nd Worcestershire Regiment was the son of Mr A Sanders. He was a gardener at Tannenberg, Church St, Malvern. Cpl Sanders was previously a gamekeeper on the Madresfield Estate, under Mr F Crowshaw. He had been so employed since he left school. 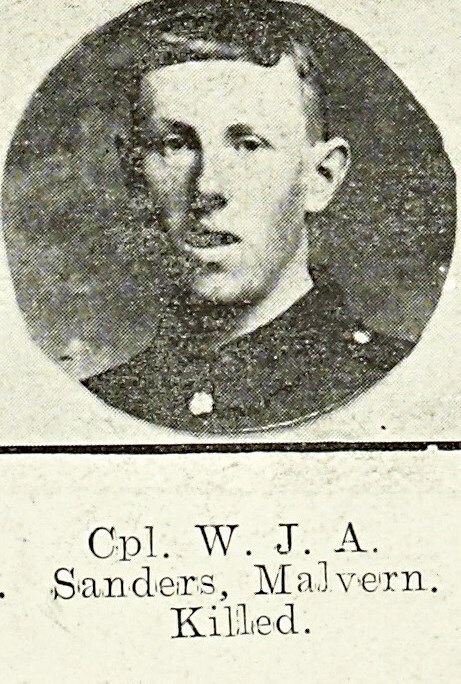 He enlisted soon after the outbreak of war, aged 19. He went to the front in September 1915. He was a great favourite and his soldierly qualities earned him the rank of Corporal. William Sanders’ father received a letter from an officer who stated that the delay in replying to his letter of enquiry was caused by the officer who received it being wounded before he could answer it. He stated that Cpl Sanders was killed instantly by a bullet, which passed through his head. In sympathy with his father, the officer stated that Cpl Sanders was one of the bravest and best in the Battalion, and was loved by all, officers and men alike, and that his death came as a great blow. Although the official history states that William Sanders died on the 2nd November, I think that he was in fact killed on the 1st. The war diary for the 2nd states: “A fairly quiet dau, but the men were very exhausted and wet from the effects of the attack and weather. Relief oreders were received during the day, and the Battalion was relieved by the 16th KRRC.” No casualties are recorded for this day. Also all the officer casualties for the following action on the 5th were recorded as being killed on the 6th (including Lieut LHP Phillips).